Charles "Chucky" Porter, the Pittsburgh mafia chieftain who gave the FBI an insider's picture of the mob from prison and helped avert a half-dozen killings around the country, died Tuesday at 82. He spent the last 16 years at his big Penn Hills house, living quietly with his wife Joyce after serving less than half of his 28-year sentence for racketeering. A judge in 2000 let him out early as a reward for his cooperation. He was the highest-ranking La Cosa Nostra member here to ever turn informant. For a man who in his own words had become a "rat" - normally a death sentence in the world of La Cosa Nostra - he seemed to have lived the remainder of his life unharmed. He and his wife went out to dinner with other couples and entertained at their home, which is equipped with a large bar. Porter was injured in a car crash in 2001 that authorities initially thought might have been an attempted hit, but by all appearances it was an accident. Long a diabetic with kidney problems, Porter died of natural causes, although the exact cause was not revealed. His son, criminal defense attorney Charles J. Porter, and other family members did not respond to messages for comment this week. The elder Porter, a former mailman from Etna, was a ferocious brawler and enforcer in his early days and in later years traded on his reputation for violence to control his underlings. At sentencing a quarter century ago, Assistant U.S. Attorney Stephen Kaufman called him "one of the most dangerous individuals ever to appear" in federal court here. But he had redeeming qualities that many other mobsters lacked. The FBI came to respect him for his manners, his devotion to his four children and his sense of integrity. "There were two sides to Charles Porter," said Roger Greenbank, a retired FBI agent who led the investigation into the mafia here in the 1980s. "There was the tough guy, the barroom brawler. And then he settled down. This guy was different [than most mob members]. He was a family man." An old-school mobster who favored suit coats and vests, he seemed to understand that he and his FBI tormentors had roles to play in a larger game of catch-me-if-you-can at a time when the Justice Department was cracking down on the mob nationwide. When an agent served him with a subpoena at his apartment early in the investigation, the agent got a surprise. “Porter invited him in, asked him if he wanted anything, if he wanted a cup of coffee," said Mr. Greenbank. "He was very polite to him." Former agent Bob Garrity once recalled how Porter told him of organized crime, "You know, we're not as organized as you think we are." Mr. Garrity responded with his own observation of the FBI: "Well, we're not as smart as you think we are." Porter, former underboss to the late Mike Genovese and among the most powerful figures in the Pittsburgh underworld, was the top catch along with lieutenant Louis Raucci in the government's landmark 1990 prosecution of La Cosa Nostra in Western Pennsylvania. He later cooperated with the Pittsburgh FBI for eight years from prisons in New York, Texas, Pennsylvania and Maryland. His assistance allowed the FBI to warn the targets of impending mob hits in Boston, Philadelphia, Pittsburgh and elsewhere and also revealed the mob's inner workings. To reward him, prosecutors took the extraordinary step of asking a federal judge to let him out early. His son tearfully testified on his behalf in asking for his release. In his heyday, Porter was a national organized crime figure who supervised a cocaine, loan-sharking and gambling empire stretching into Ohio and West Virginia and used his position as a "man of respect" to mediate mob disputes from Philadelphia to Chicago. He and Raucci, of Verona, served as the "right and left hands" of Genovese, long the reputed head of the Pittsburgh family until his death in 2006. Despite being only part Italian — his mother was Italian, his father Irish — he became a made man in 1986 and was being groomed in that decade by Genovese for leadership. Like any good drug boss, he insulated himself from cocaine dealing even though he was plainly orchestrating the entire operation with a combination of intimidation and street smarts. In court, former Assistant U.S. Attorney Bruce Teitelbaum told U.S. District Judge Donald Ziegler that drugs never passed through Porter's hands, but "he was there pulling the strings of the managers of the drug deals." Outsiders also knew he was a player. In 1986, the Philadelphia mob leaders, including boss Nicodemo Scarfo, came to the mafia's hangout at the Holiday House in Monroeville to settle a dispute with the Pittsburgh family, which had been shaking down a Clairton bookmaker who was Scarfo's brother-in-law, and to ask if the Pittsburgh family wanted to invest in video jukeboxes. Philip Leonetti, underboss to Scarfo, said in court that Porter was among the Pittsburgh family members at the meeting and talked about how close he was to Genovese, handling loan-sharking and extortion of drug dealers and bookies. In the end, the families cut a deal so that Philadelphia would get a cut of the bookmaker's earnings. "The next morning we had surveillance and we saw Genovese and Porter walking around, just the two of them," said Mr. Greenbank. "Chucky was point man for the family on that meeting." Born in 1933, Porter grew up in Etna with two siblings, Billy and Eleanor, and graduated from Central Catholic High School, where he was on the rifle team. "I always found that interesting," said Mr. Greenbank. In the 1950s he served in the U.S. Army in Germany during the Korean War, then became a letter carrier in his hometown. He gravitated towards gambling and by the 1960s he was in charge of gambling operations at clubs in Lawrenceville, the East End and elsewhere. He had a penchant for fighting, getting into brawls along with fellow mobsters John Leone and Eugene "Nick the Blade" Gesuale in bars in Shadyside and Downtown. The first major crime in the 1990 indictment came in 1967, when he and Paul Mazzei, the "Pittsburgh connection" portrayed in the movie "Goodfellas," robbed a finance company on Penn Avenue. In later years he became a regular at the Beacon Club in Squirrel Hill, where he collected from bookmakers and loanshark customers. In one 1977 incident, he and Leone went to the Razzberry Rhinoceros in Shadyside to collect a sports bet. The men got into a fight in which Porter beat a man with a baseball bat and Leone gouged a man's eye with a broken wine glass. As he rose through the ranks of organized crime, Porter settled into family life. He had three children with his first wife, Barbara: Charles, Michael and Linda. He also had a daughter, Tiffany, from another relationship. Porter always supported Tiffany; at his sentencing, she was 14 when she pleaded for leniency for him. The children were largely insulated from his life of crime, sources said, although the mob life was ever-present. When Charles Jr. graduated from law school in the mid-1980s, his father threw a big party at the house attended by many mobsters and associates, according to the FBI. One of them was Joe Bertone, a mob associate and McKeesport restaurant owner seen in earlier surveillance with Porter at the Holiday House. He disappeared the day after the party and has never been found. 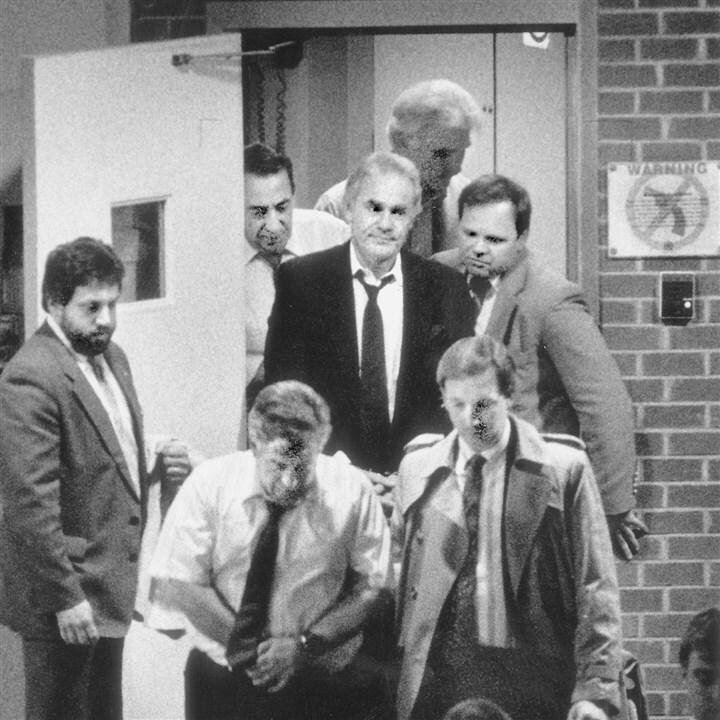 Porter grew in stature throughout the 1980s, becoming close with former mob boss John LaRocca, who died in 1984, and with Genovese. It all ended with the 1990 indictment. It was the largest prosecution ever of the Pittsburgh Mafia and largely dismantled a family that had dominated the local rackets and influenced labor unions and politics here since the bootlegging days of the 1920s. The local family never recovered. The Porter information pipeline dates to 1991, when the prosecution team sent letters to the mobsters' lawyers telling them they had a year to decide if they wanted to turn informant. Mr. Greenbank and others met with Porter at a U.S. Air Force base near the New York prison where he was being held and suggested he could get out early if he cooperated. He agreed. "In my dealings with him I found him to be pretty upstanding," said Mr. Greenbank. "But you never get 100 percent from somebody. The whole reason we went for Porter's cooperation was to get Mike Genovese. We said we believe you, more than anyone, has to have information to put together a case against Mike. It just wasn't there." But Porter did give up enough information to earn his release. In asking for his freedom in 2000, he told Judge Ziegler: "Hopefully if I can spend some time with my children, maybe I can ease some of the pain I've caused." Porter is survived by his wife and children. Funeral prayers were set for 9:30 a.m. Saturday at St. Bernadette Church, Monroeville, followed by Mass of Christian Burial at 10.
Who is going to take control of the Philadelphia mob?